RRB Staff Nurse 2019 Syllabus:- Hello Job Seekers, The Railway Recruitment Board has announce the RRB Para Medical Staff Syllabus 2019 in Hindi. If you are searching the RRB Staff Nurse Exam Official Syllabus in Hindi PDF, Then you are on right portal. We have given the Railway Pharmacist 2019 Exam Pattern PDF also. So you can the complete details on this page. Aspirants who have applied the Railway Paramedical Staff Vacancy Form can access the RRB Staff Nurse Syllabus 2019 in Hindi. Candidates can check the Railway Pharmacist 2019 Written Exam Syllabus through the link given on this page. To secure a place out of these 1937 vacancies you need to be aware of the RRB Paramedical Exam Pattern and Selection Process 2019. Applicants are required the RRB Paramedical Staff Exam Pattern with Subject Wise for the Exam preparation. We have provide the Railway Para Medical Staff Syllabus PDF. So contenders can check & access it from here. For more details check the official site also. The Exam syllabus help you in knowing the topics detail that are asked in the examination. Not only the RRB Staff Nurse Syllabus in Hindi PDF but knowing the Exam pattern also compulsory. The RRB Para Medical Staff Syllabus has the various Question paper structure. So, Contenders of RRB Paramedical Staff 2019 Bharti need to follow the latest Railway Paramedical 2019 Exam Pattern for the online exam. The Selection Process is based on CBT, Interview and Document Verification. There shall be a CBT for all the notified categories followed by document verification. There shall be Negative marking in CBT (Computer Based Test/ Examination) and marks shall be deducted for each wrong answer @1/3 allotted for each questions. The Railway Paramedical exam have total 100 questions to solved in 90 Minutes. The Question Papers shall be of objective multiple choice type with four options. Only one of these four options will be the correct answer. The questions likely to be include questions pertaining Professional Ability, General Awareness, Arithmetic, General Intelligence & Reasoning and General Science. Note:– For PwBD the time duration is 120 Minutes. 4. Dialysis Technician Anatomy, Biochemistry & Pharmacology, Physiology, Introduction to Kidney diseases, Principles and practice of Dialysis. 10. Physiotherapist Psychology & Sociology, Anatomy, Physiology, Applied Physiology, Basic and Applied Physics for Physiotherapy, Basic Nursing & First Aid, Orientation to Physiotherapy, General Medicine/General Surgery/Paediatrics/ Geriatrics, Bio-mechanics, Applied Anatomy & Kinesiology, Exercise Therapy, Microbiology and Pathology, Electrotherapy(low & medium frequency), Electrotherapy (high freq & Actinotherapy), Community Medicine, Clinical Orthopaedics, Clinical Cardio-Respiratory Diseases, Bio Statistics & Research Methodology, Physical Modalities Maintanence, PT in Orthopaedics, PT in Neurology, Pt in Cardio Respiratory Conditions, Rehabilitation Medicine, Advanced Physiotherapeutics, Physical Education. 12. Radiographer Human Anatomy & Physiology, Radiology Physics, General Physics, Radiation Physics & Physics of Diagnostic Radiology, X-Ray Machines & Accessories, Maintenance, X-ray Film / Image processing Techniques (Dark Room Techniques), Clinical Radiography-Positioning, Medical Ethics and patient care, Principles of Medical Emergencies, Equipments, Techniques of modern Imaging Modalities, Contrast & Special Radiography procedures, Quality Control at Radiology & Radiation Safety. 13. Speech Therapist Sound and Hearing, Anatomy and Physiology of ear, Hearing loss, Evaluation of hearing, Early identification and prevention, Speech & Language Pathology, Anatomy and physiology of speech mechanism, Disorders of speech and language, Assessment of speech disorders, Assessment of language disorders, Hearing aids and earmolds, Auditory learning, Speech reading, Education of children with hearing impairment, Rehabilitation, Disability issues, Management of speech disorders, Management of language disorders, Educational issues, General issues in management. 14. ECG Technician Anatomy, Physiology, Biochemistry, Pharmacology, Introduction to Cardiovascular Diseases, Basic Cardiovascular Investigations, Advanced Cardiovascular Investigations. 15. Lady Health Visitor Community Health Nursing, Health Promotion, Primary Health Care, Midwifery, Child Health Care Nursing, Health Center Management. 16. Lab Assistant Grade II Anatomy, Physiology, Biochemistry, Fundamentals of Medical laboratory Technology, Microbiology, Clinical biochemistry, Pathology & Histopathology, Haematology and Blood and bank. 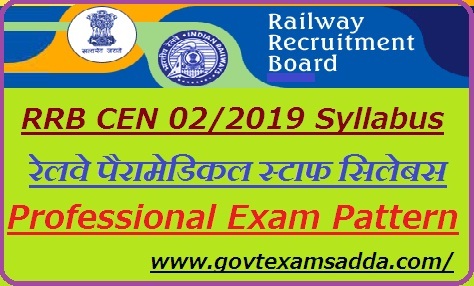 Contenders are suggested to refer only official Railway Paramedical CEN 02/2019 Exam Pattern, Because the Railway Recruitment Board prepare the written exam paper from the RRB Para Medical Staff Syllabus 2019 only. If you have any query than comment us.